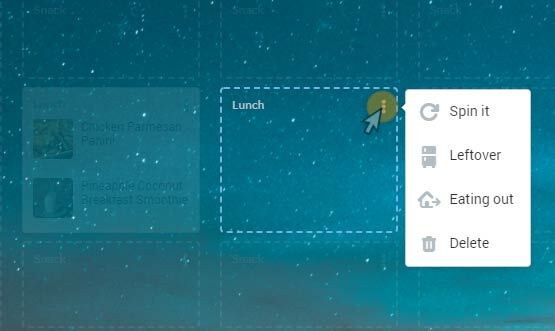 Click on the three dots at the top right corner of a Recipe on your Meal Plan Calendar to give you a drop-down menu. Click on your preferred choice between Spin it, Leftover, Eating out, and Delete. 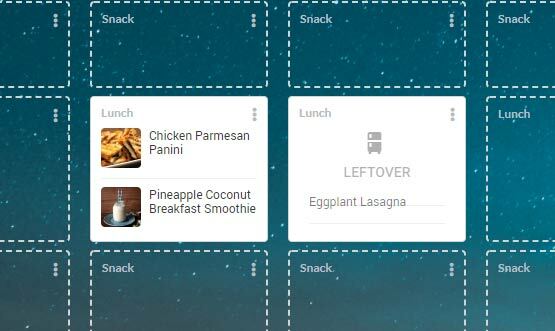 Each Recipe on your Meal Plan Calendar has the “Leftover” and “Eating Out” features. You can simply make a Leftover by writing the recipe to which the leftover corresponds. You can get another recipe randomly using Spin it. If you are planning to eat out you can check the option of Eating Out and write to what restaurant you&apos;re planning to go.